I've been sitting here trying to think of words to describe how this picture makes me feel, but there are none that can even come close. Seeing our two girls sitting there smiling is making me smile and laugh just looking at their picture. I love watching them interact. Avery loves to entertain (she actually used that word 2 days ago) her sister. This morning, we were outside on the swing and Avery was talking to Addison and making faces at her. Addison was smiling so big and actually laughing! It made my heart feel like it was going to leap out of my chest! I absolutely adore them and look forward to seeing their bond deepen as time goes by. Addison is displaying her unique personality! Her open-mouthed laughs are my favorite! She is such a happy baby in the mornings. 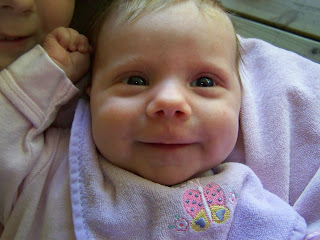 And, since she has been getting her stomach lined out, smiles and coos all throughout the day. She loves having her big sister entertain her. Lately, her happiest times are outside on the deck, swinging in the swing that she, her daddy, and her big sister got for me for Mother's Day. Avery began gymnastics about a month ago. She really loves tumbling, jumping in the foam pit, playing with her friends Eva Grace and Chloe, and her teacher, Ms. Cassie. Her mom believes her favorite part is dressing up in her leotard and skirt and looking at herself in the big mirror! Avery had her first preschool program on May 15th. 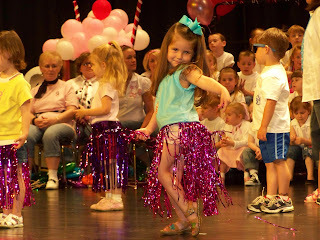 Her classroom performed Surfin USA and The Twist. It was so cute! Avery stood front and center for everyone to see. She put on quite a performance and even walked to the edge of the stage to hold her arms out to her daddy and me right in the middle of the song! I shook my head no from the second row and she folder her arms and got very mad! The audience, of course, thought this was very funny! She proved to be a true "teacher's kid!" 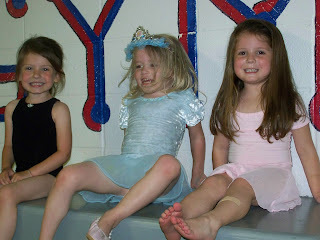 She did look really adorable doing the twist and interacting with her classmates. 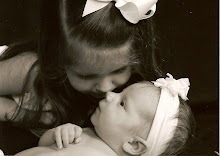 We have two beautiful daughters, Avery and Addison. 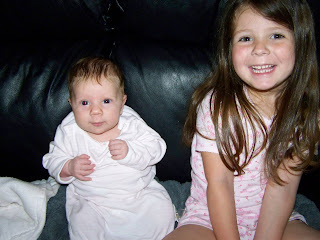 Avery is four and we were blessed with Addison in March. We love sharing pictures and stories about our girls! My Christmas present from Dad.